Batgirl is on a manhunt, for her criminally deranged brother. He’s been released on some drug-fueled rehab program, which even in the world of comic books I have a hard time buying. That a murderer could be released, yes. That a person convicted of multiple homicides could be released, and his sister – her dad’s a COP! – never being any wiser, THAT I have a hard time believing. 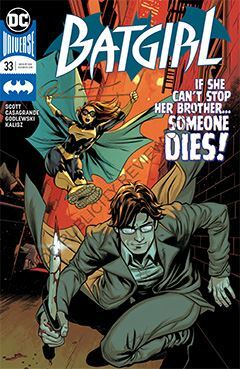 But, too his credit, said homicidal brother is at least able to discern that his sister and Batgirl are one and the same – something dear old dad was unable to do a few issues back. But… it’s a welcome respite from all the political posturing that’s been going on in recent issues. We’ll see enough of that in the real world in the months to come. Regrettably, the work of artists Paul Pelletier and Norm Rapmund is not featured in this issue. Not sure if they’re taking a break or off the book permanently. But Elena Casagrande and Scott Godlewski are suitable replacements, temporary or otherwise. Unfortunately, last issue dovetailed into the Batman Who Laughs, which I never followed up on, so it’s as if there is a chapter missing. I find it disappointing that a narrative needs to digress into another title entirely. DC seems to be doing that a bit lately; I’d rather they didn’t.